Within the last few months, there has been much controversy surrounding a man named Dan Burisch (aka Dan Crain), who claims to be a microbiologist working for a black budget project. Burish claims he has been working with an alien named J-Rod for several years at the infamous S4 complex located near Area 51. While Burisch's story is still under investigation, the photo above surfaced on the Coast To Coast AM website with the following caption, " J-Rod Photo This Xeroxed photo (courtesy Ron Garner) is purported to be the "J-Rod" alien that microbiologist Dan Burisch has spoken about. 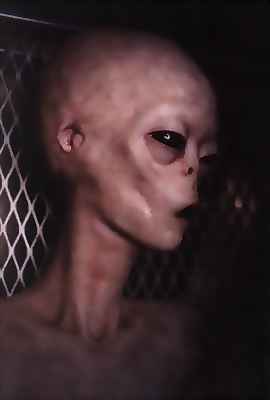 Well, if this is supposed to be proof of Burisch's contact with an alien, then a lot of people are in for a major disappointment: The photo below made the rounds on the Internet during January 2000 and caused quite a stir, if not some heated debate. That was until it was discovered the alleged alien was the work of FX Masters.com, a website formerly dedicated to the art of special effects. You can view a page from the website showing a picture of the alien and a description stored at Archive.org by clicking here. Below is a copy of the original photo circulated by Russell Dowden of the now defunct setlab.org. Dowden was the person who had originally made the photo public via his website after anonymously receiving it. Dowden was on Coast To Coast AM with Art Bell after the photo was first received. Word quickly spread of the bogus photo and many websites, including Whitley Streiber's, posted stories about the photo not being legitimate. The photo was well known among UFOlogy to be fake...or so all thought. ABOVE: Photo of alien created by FX Masters. ABOVE: As you can see, the photocopy (left) provided to Coast To Coast is nothing more than an inverted copy of the original image (right). spoken about. Click here to view larger and read about the C2C/UFO Mag. Challenge. Ron has just put one over on you. That phony photo was received by my friend, Winston Smith, and Ron Garner took a photocopy of it. It has no connection to J-Rod. The UFO Magazine challenge (Ed. Note: The link is gone.) is ludicrous. A photo of Dan and Marci with three of his handlers!! What a laugh! These were visitors, one named Rob from the UK, Serge from the Ukraine, and John Henderson from California. Why do you swallow this crap without checking on the facts? I will broadcast this far and wide on the net and your show will lose any shred of credibility it has left. "That photo was sent to Winston, a friend, who in turn sent it to me and I printed it off before lunch with Ron Garner and Winston. Ron insisted on having a copy so I gave it to him saying we have not examined this yet. He turns around and gives it to Bill Birnes as a photo of a J-Rod. This was Garner perpetrating a fraud on Bill Birnes and George Noory and has nothing whatsoever to do with the Burisch case." Guess that answers how Garner came into possession of the image. It also provides answers about some photos taken by Garner of Burisch at the Little Ale'Inn, which someone alleges to show three of Burisch's "government handlers" with code-names like "Boomerang", "The Russian", and "Uncle John". It is unknown who supplied these supposed code-names, or if it was simply meant as a joke, but Bill Hamilton says the three men in the picture with Burisch are simply visitors to the area and have no official connection to Burisch at all. 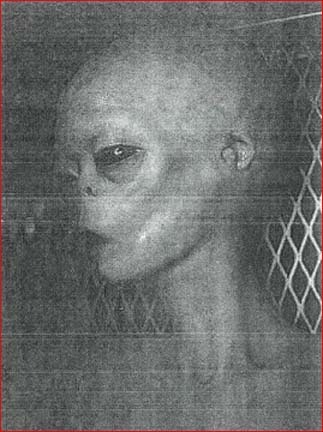 So, if this is the work of an FX team and Hamilton states it has nothing to do with the Burisch case, then how is it that this came out as a picture of the alien Burisch alleges to have had contact with while employed by the United States government? Innuendo? Conjecture? Wishful thinking? As for the challenge presented by Noory and Birnes involving Birsch submitting to a polygraph examination, UFOWATCHDOG.COM believes this would be a complete waste of time and resources that could be further used to investigate the alleged background of Burisch. What this website feels should happen is that Burisch should agree to fully and willingly participate in a thorough, in-depth background investigation to be conducted by at least three independent, competent, and experienced investigators. If Burisch is telling the truth, then his story is one of the most important in history. If Burisch's story is a scam, which many people seem to think it is, then Burisch should be thrown in jail for fraud among a series of other charges that could be leveled against him. In the end, UFOWATCHDOG.COM sees this story as dead ending in debate and fading away, just as so many other cases have, and this latest round of UFO researchers tripping all over each other just shows you how dysfunctional this field is. Why would the government waste its time and resources running a disnformation campaign when they can readily count on the so-called UFO community to do a Three Stooges act for all to see..."Hey, Mo!" by XFX team, Steve Johnson and Trey Stokes. It was featured on a reproduction of the ALien Autopsy on a 20/20 show, aired on April 4, 1997. That particular image was featured on XFX website, as you may remember, some years ago. All the credit for collecting and archiving these images, as well for the info, go to the Mexican researcher Luis Ruiz Noguez. " Mori also provided a link to the Internet's best Alien Autopsy investigative site showing more of the images (Ed. Note: Site is there, but images appear to be gone.) from the 20/20 broadcast. Sincere thanks to Kentaro Mori and Luis Ruiz Noguez for the images and information. For anyone giving the photo on the Coast To Coast AM website any credit as being authentic, there can now be no question as to the origin of the photo. But, how did someone come to the conclusion that the photo was Burisch's alleged 'J-Rod' alien when it was a well known special effects creature and why was it not investigated prior to being released?